Bushy tailed Jirds are found Arid and rocky environments in many parts of in central Saudi Arabia Eastern, Egypt, Sinai, South-East Israel and Jordan. 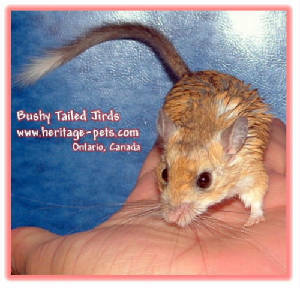 To the novice, Bushy Tailed Jirds appear similar to a Mongolian Gerbil. However they are actually quite different and unique in their appearance. 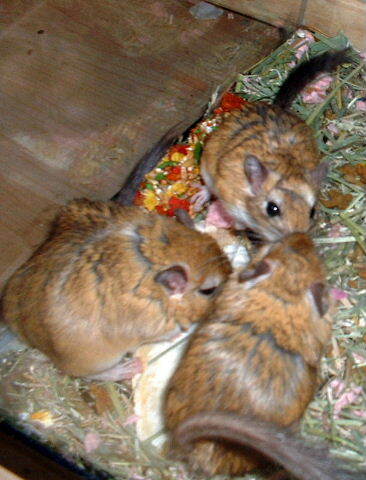 Also, they have different habitat requirements and special dietary considerations, than the common Pet Store Gerbil. They are sweet natured social little animals that quickly learn to respond to their owners and I think that is part of what makes this charming animal so attractive to pet owners. The body length is approximately 10 - 13 cm, not including the tail. The tail adds yet, another 13- 16 cm giving an overall length of around 25 cm. In the wild mature animals weigh about 45- 50 grams while their captive cousins weigh almost double that. 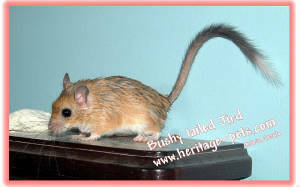 Bushy- tailed Jirds can be identified easily from their gerbil relatives by the color of their coats. Their fur is a yellowish, reddish-brown color with black hairs scattered throughout its’ coat. There is a well defined between the top/back colour and the belly which is a crisp white. The ears are grey and sometimes have white hairs behind them. Their tails, which are brownish grey with white tips, are covered with long hairs that really stand out, creating a feathery appearance. 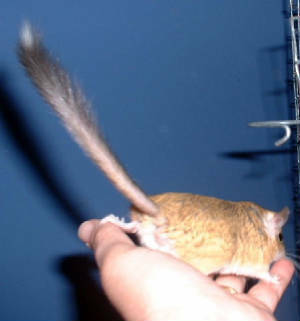 The males have an especially full and flashy tails. Bushy- tailed Jirds have naked soles on their hind feet which assists them while climbing around the rocky surfaces, where they are found naturally, in the wild. Their head is long and slender, with long whiskers, round eyes and large ears. TIDBIT* … It appears that according to BJT law, only the most affluent animals in the community are permitted to carry the showy tail that trademarks this species. In a colony situation, the male and females with the bushiest tail are most often the often the Alpha pair. In BTJ society everyone has their place, and it is all a natural part of being able to identify the status of a particular member of their group. The further down the ‘pecking order’ you are in BTJ society the less likely you will have that lush bushy tail and to keep order in the group other members of the bushy tailed Jirds’ family groom each other, paying more attention and excessively grooming the tail causing the fur from growing in too long. Bushy tailed jirds live in close knit family groups and being that they are such social creatures, not only is it unfair to keep one alone in captivity but most likely they will perish without having the companionship of other members of their own species. Before setting up a home for a BTJ it is important to remember where they originate from and how they live in their natural environment. They live in an arid, rocky environment and they make nests and burrows under boulders, and rock overhangs. 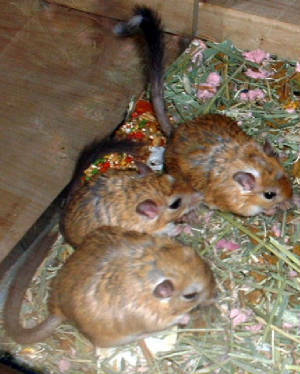 They are very good climbers and enjoy climbing and scurrying around investigating everything in their environment. Being that BTJs enjoy burrowing and spend a lot of time excavating new tunnels, it is probably best to keep them in a large tank, it is less messy. Their enclosure needs to be as large an area as you can provide them with. The smallest enclosure should be no less then 20 gallon tall aquarium furnished with a tight fitting, escape proof, tank extension, on the top of it. If you have read that it is okay to keep them in a ten gallon aquarium you have been misinformed. Jirds are very active and need space and they will make use of as much room as you are willing to provide them with. Their tank should be equipped with numerous branches, platforms, safe non-toxic toys, and sisal ropes for them to climb on. They also need several items that will serve as den sights. There should always be at least one extra den area per total pairs of Bushy-Tailed Jirds pairs in the tank. All nests or dens should have two entrance holes and they need to provide adequate darkness for the jirds to sleep in during the day. Although Bushy-tailed Jirds tend to be nocturnal in the wild, it has been found they are also active during the day when they are kept in captivity. As bedding I suggest using a combination of fresh clean hay combined with shredded aspen wood bedding and fluffed absorbent newspaper. BTJs will use the hay to build a nest and tunnel under and also it provides them with a little something to snack on when they get bored. The newspaper and wood helps control odors and keeps the air in the tanks a bit drier. Bushy tailed Jirds are omnivores and they require a diet that is higher in protein than other animals of similar species. While they eat mostly seeds and lentils, fruits and vegetables and animal protein is a very important part of their normal diet. Animal protein can be offered in the form of insects, which they will hunt for, dry kitten food, or cooked chicken. Jirds seem to enjoy most fruits and vegetables whenever possible citrus fruits and light green lettuces should be kept to a minimum. It is very important that your pets have a good quality small hamster/gerbil mixture of seeds and good quality timothy hay available at all times. They also need to receive a little of everything else mentioned, at least twice per week. Water must be available at all times. By offering cuttlebone and mineral blocks on a regular basis these animals will get most of the extra calcium they need. Bushy Tailed Jirds are semi-monogamous. The alpha male who is polygamous, will breed with as many females he can during the breeding season. 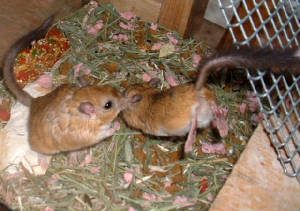 Both the male and female are sexually mature when they are about 3 months old. Therefore they can produce their first litter when they are just less than 4 months old. Breeding this early is not advisable as most young mothers are too immature and often fail to raise their pups. It is best to wait until they are 5 months of age before attempting to breed them. The gestation period is about 21-23 days, the average litter size is usually 3-4 pups, but litters of 8 or more are not unheard of. If you think you might be interested in owning these charming little pets or if you are breeder who is serious about working with the newer colour varieties of BTJs feel free to email us.